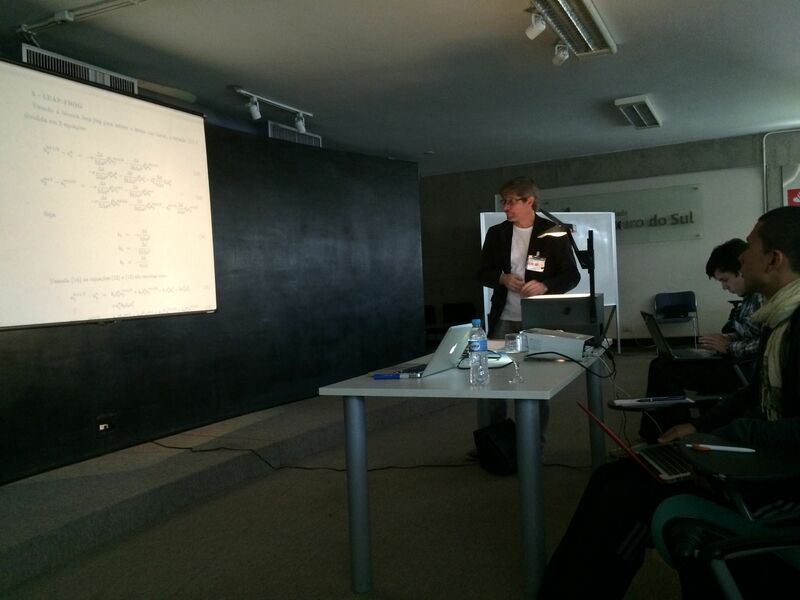 Helio Rocha-Pinto (Observatório do Valongo, UFRJ) gave us a very nice summary of astrostatistics, i.e. application of different statistical methods to astronomical data. It is always good to hear somebody very knowledgeable on the subject talking about things you used in the past. He focused on using R and I am increasingly convinced I should learn to be fluent in R for astronomical purposes. Paulo Penteado (Northern Arizona University) has been telling us about parallelization methods beginning with vectorization, then moving on to OpenMP (memory shared) and ending in MPI (distributed memory). Paulo is extremely knowledgeable on the subject. He began describing the basics of the subject and will give us practical details on implementing openmp and mpi in your own code. Reinaldo Rosa (INPE) spoke about numerical methods for cosmological simulations, starting with methods for solving hydrodynamics. He even used, at some point, an old-fashioned — some would call vintage — slide projector to describe how diffusion arises from the Navier-Stokes equation.